Swingin' Utters, Taking the Long Way 7"/digital out November 23rd! 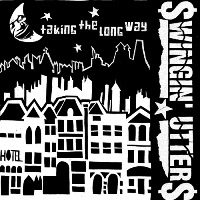 Seminal punk band, Swingin’ Utters, will release a new 7” titled Taking the Long Way on November 23rd; featuring two songs from their upcoming full length and one exclusive to the 7”. European fans can grab it early as the band kicks off their tour on November 5th, check the dates here! The 7” will be available digitally and for a limited time on color vinyl so stay tuned for our pre-order announcement. Take a peek at the art work below designed by singer, Johnny Bonnel!